In my last blog post I insisted that everyone should learn how to code. If you are a JIRA administrator who would like to do some advanced sort of stuff, keep reading, you'll find out how a little bit of coding can help marvellously. I have a limited OOP background, in fact I've never been a Java programmer, so I find having to deal with this sort of things very exciting. I wanted to do some cleanup of a huge JIRA instance that has been bit messed up with a LOT of schemes (workflow, issue type, field configuration, etc.). Something I learned from my past experience is, per-project schemes in JIRA is a very bad idea. It affects the manageability of the JIRA instance when it grows. When it comes to duplicate Field Configurations in JIRA, it is extremely difficult to find them by hand. Normally I would query the database to identify the duplicate schemes in such cases, but when I wanted to see how many duplicate JIRA field configurations exists, Oracle SQL met a likely dead end. My plan was to list-aggregate each field's configuration against field configuration's name, and then use SQL "having" clause in a parent query to find out duplicates. This didn't work due to the limitations of Oracle's "listagg" function. Of course a custom "listagg" written in PL/SQL could have helped, but I didn't want to create any additional objects in the database. Also, I wanted to do something that I have never done before. Thus it came to Groovy. First you need the JIRA Script Runner add-on (in my case it was already there). This add-on provides a Script Console in which you can code Groovy. It doesn't come with a handy IDE, but just a basic code editor. Serves the purpose. If you execute the following one line piece of code there, you'll see how simple it is. It's based on Java, but lot more simpler to use. If you are scared of OOP like I used to be, here's your chance to practice by swimming in shallow freshwater. It will do neat HTML! Here's the piece of code I wrote in Groovy. I'll explain how it serves the purpose as well. Edit: I've noticed that SyntaxHighlighter intermittently messing up with the HTML parts of the source code above. As a quick workaround I broke the HTML tags to avoid breaking the whole thing. Alright, you got the fish, now here's how to fish. If you have a limited JIRA API knowledge like I do, it's better to start reading with the first two import lines. 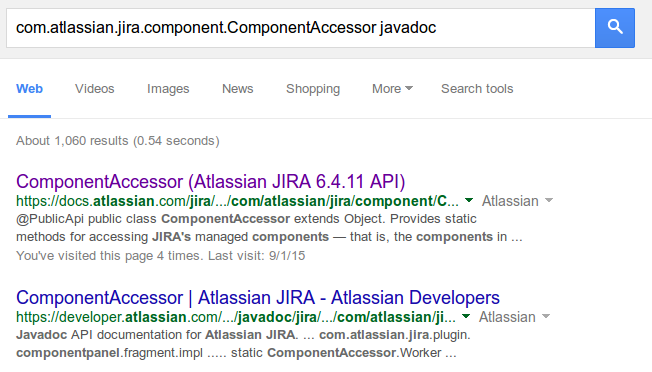 All you have to do is a Google search, entering the package name followed by "javadoc". Everything seems neatly documented, right? How did I find that FieldLayoutManager package will give me the exact information I need? For that I had to do some keyword searches on the web, go up and down in the API documentation and read some of the package descriptions carefully to choose the correct one. I (had already) learned that FieldConfiguration has a different meaning internally, and Field Configurations are internally called FieldLayouts. A FieldLayout has FieldLayoutItems, each item describes characteristics of a single JIRA/ custom field within its parent Field Configuration. The information I need here is a list of Field Configurations against aggregated list of each item's field characteristics for comparison. Initially I read through several interfaces under com.atlassian.jira.issue.fields.layout.field package, but with a little common sense I soon realized that FieldLayoutManager interface is going to give me the information I need (it manages the field layouts - so it might give me a list). The next important line shows how you create a FieldLayoutManager object. See that's not the 'conventional Java way' which we learned at school but using the ComponentAccessor. This is something I learned from observing other developers' work, but the reasoning is out there in the JavaDoc. Next, we use the getEditableFieldLayouts() method to get the list of all Field Configurations in the JIRA instance. As you can see in this line, you don't have to declare an array and then call the method. That's simplicity of Groovy. Now, the question is, what did it return? What's the value of x? According to the method specification of getEditableFieldLayout(), it's a List of EditableFieldLayout objects. In human readable terms, it's the list of Field Configurations in JIRA. Now we know the list of Field Configurations. However, they don't come in pretty neat looking strings. They are still Java objects. Each Field Configuration returned is a Java object. We don't know what's inside yet. To see what's inside, I'd take a look at the JavaDoc of the EditableFieldLayout class. It has two methods that I'm interested in, one is getName(), which returns the human readable name of the Field Configuration. The next is, getFieldLayoutItems(), which returns a List of FieldLayoutItem objects. That is the list of fields with characteristics of each. But now, this list inside list thing is getting deeper by one level, and do we really need to dig that deep? Here's the turning point. My original requirement was to find the duplicates. It doesn't mean that I should follow the same thing I attempted with Oracle. What I actually need is something against each Field Configuration's name that uniquely describes the entire Field Configuration. This is where hashCode() method in Java comes to play. Every Java Object inherently gets this method. It generates a unique 32-bit hash of the object that is is invoked from. Whenever the object changes, the hash also changes. In this particular case, what we need is to hash the List of FieldLayoutItem objects of each Field Configuration. With a little bit of HTML formatting to append the Field Configuration - Hash pairs into JIRA Script Console's page, we get a nice table which we can copy-paste into a spreadsheet program and then easily find the duplicate items. Two Field Configurations have the same hash means both Field Configurations are identical. Just copy-paste the provided source code into your JIRA instance's Script Runner Console and see the results. Create a Field Configuration and execute again. Make a field mandatory in the new Field Configuration and then execute the script again to see that hash also changes. Revert back and the hash also changes to the previous value. The piece of code I wrote here is not a big deal. I just took some effort to describe it to those who have a little coding knowledge. But see the beauty of results! Executing .getClass().getName() method on any Java object returns the name of its constructor class. You can then google the classname followed by 'javadoc' to find all the information you need to know about that class, including available methods. This can be helpful when you work with any API you are not familiar with. With log.debug(), you can append this to the application log. I recently read in a funny webcomic that today's computer programming is actually 'Googling the StackOverflow'. Most of the things you need are already out there. What you need is to get the parts together and 'assemble' in the proper manner. Most of the time all you need to have from your own is a clear idea of what you are going to achieve, and the way you are going to achieve it. Although I started explaining the packages imported in the first two lines, the correct way to start writing your own script would be to find out the Java classes that represent the key objects that involve in your mission. Coding improves your health, isn't it? Think how. Thanks for reading! I've been a JIRA administrator for more than four years with the hope that time would permit me to blog anything about JIRA. Finally here it has come to that - my first blog post on JIRA administration! Now, let me explain a case where AUI hacks can save you from cumbersome work. It really frustrates me of when it comes to the status mapping part. I hate repetitive work. Especially when your JIRA project has a lot of issue types with a lot of Issues this step is a nightmare. For simplicity, let's just assume all issue types follow the same workflow in the workflow scheme. 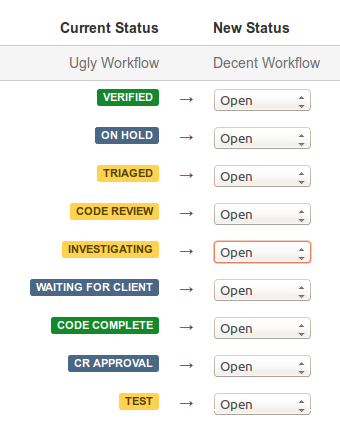 Imagine your JIRA project has ten issue types and current workflow has ten statuses that do not exist in the new workflow. Then JIRA will give you 10 × 10 = 100 drop down lists to pick the new status mapping for each type-status. And it's a highly error prone when you do this by hand. I’m using the Mozilla Firefox web browser with Firebug add-on here because it’s my familiar environment. But you can use vanilla Firefox or Chrome browser with pre-built development tools. 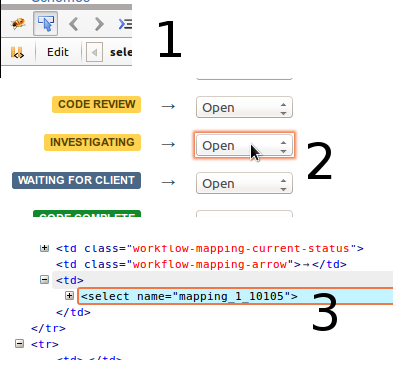 First, when you are at the status mapping step, inspect a drop-down list using Firebug. When you expand the HTML code for the select list, the HTML elements for the available options become visible. The value for each option is actually the ISSUESTATUS.ID column in JIRA database. The code says, "Make every drop down option who's value is 3 (In Progress) the selected option of its parent select element". Execute it in the Firebug script console and you can see all the drop down lists change their selection at once. Now that was simple. Imagine you have discussed with the project stakeholders about how existing issue statuses should be mapped and agreed upon a mapping. For this example, let's take only two statuses. Now, you can't use the above one line code because you want to 'filter off' old statuses other than "Investigating" before you change the values to "In Progress". Same applies to the "Verified" old status. What is the benefit of this whole process if you have spend more time on Firebugging and reading jQuery documentation than you could have just updated all entries by hand within a couple of minutes? Because this approach is less error prone. If your client or stakeholders are paranoid about data integrity, a wrong selection on a production environment can end up in a nightmare for real. If you are doing data migration projects that have to do multiple rounds of testing and UAT, then this approach is a one time investment. You can save your code somewhere and reuse in each testing iteration. This ultimately saves a lot of time. And to finish,... thanks for reading!